In the morning we packed up and headed south to see the Cambodian border town. First stop was the fishing port. 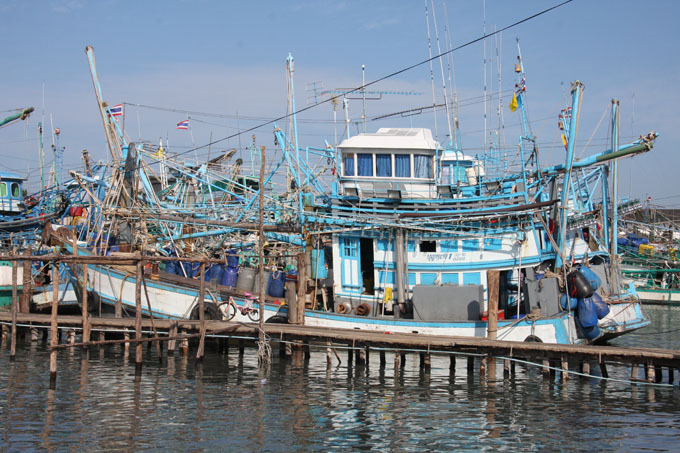 The fishing boats are very short and squat and have really complicated rigging. 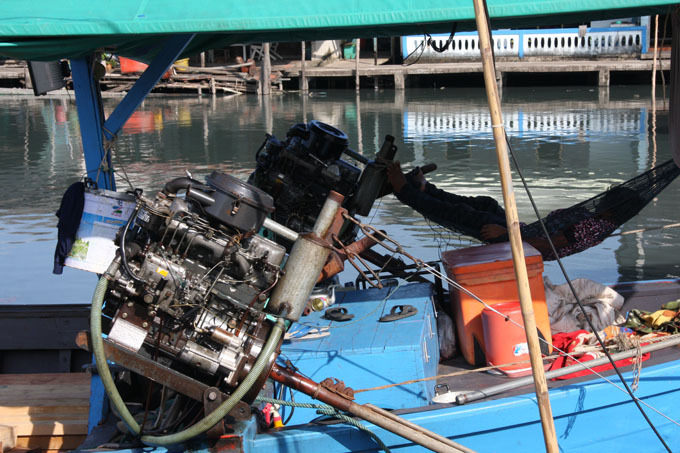 Some of the small boats were driven by two car engines with longtail propshafts. No wonder they are so loud, the exhaust is straight through, with a water jacket to stop it glowing cherry red. We stopped briefly at the border market, but it was just the same things for sale that we had seen before, and so did not stay long. We decided instead to head towards Chanthaburi and the beaches in that area. It is too warm to stray too far from the water during the day. 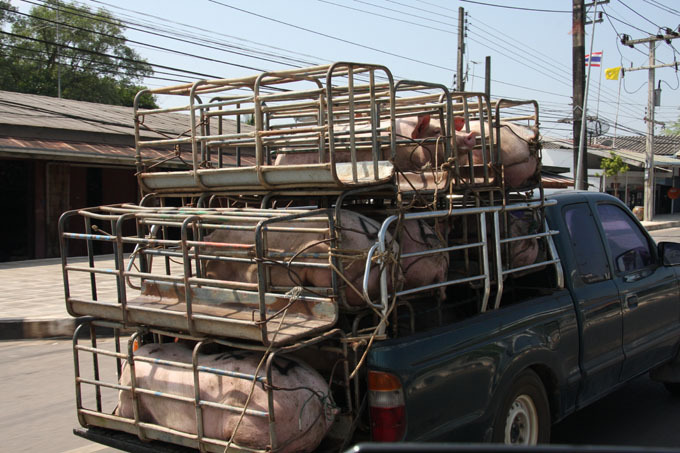 Eight out of ten vehicles on the road in Thailand are pickups. 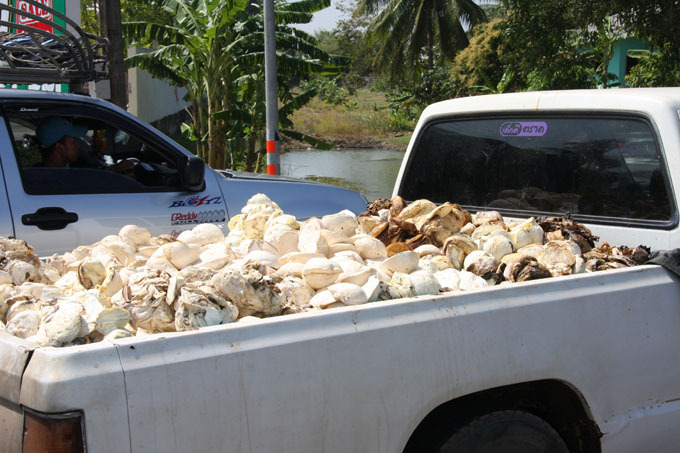 Lots are just used as shopping cars or general transport as it is fashionable to have a pickup. 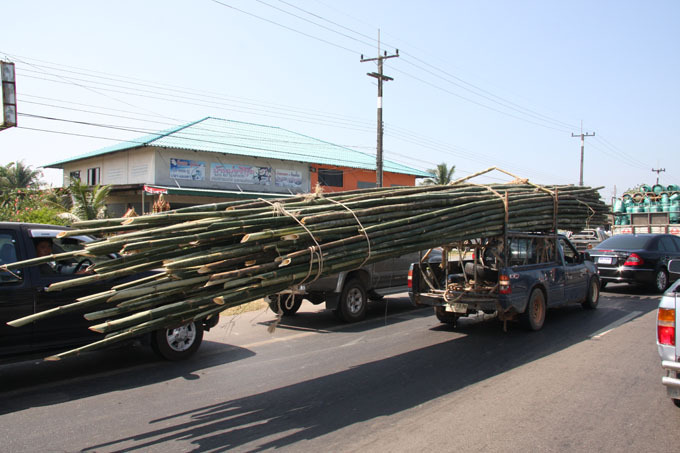 However lots of them are used to transport goods, as they were intended. Just to give you a flavour … This one has balls of raw latex tipped in from the cups that collect the sap on the rubber trees. Just because its got rubber on, doesn’t make it safe! Juice from the balls splashes up as you drive behind and smears all over the windscreen! It then takes ages to clean it off …. avoid it if you can! 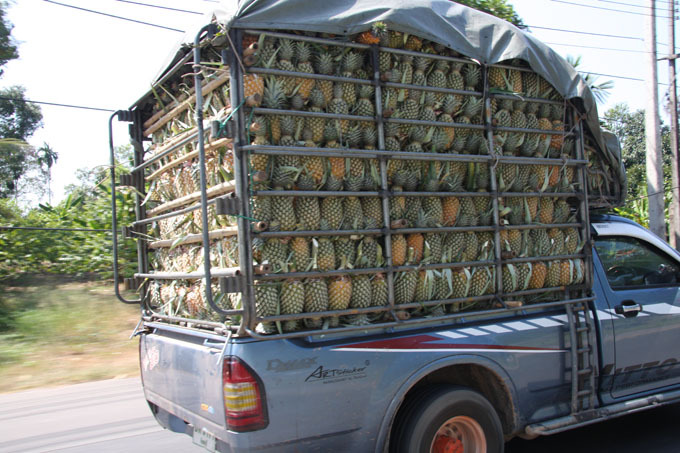 Sometimes we are amazed at how high they are piled up or in this case how long the load is …. nobody seems to mind! We arrived at the Aquarium at Chao Lao Beach and parked in the carpark just across from the sea. When we asked, they were happy for us to park there for the night and suggested we use the toilets and showers! Free camping in Thailand is so easy. Its surprising that we have not seen any other camper vans here, it is the perfect place. Having slept on our decision to ship the car directly back, we had not changed our mind and so booked tickets home to the UK in mid January. ← 24th November – Bancheun Beach again!